Is leaving the ball an extinct art form? As a child growing up in Pakistan during the 80s and 90s, few memories persist beyond Miandad’s famous six at Sharjah. One thing that I do remember is that cricketing whites were much tighter, the collars more open and perhaps the resulting copiousness and overhang of chest hair was a statement of cricketing intent. Gross exaggerations and gory imagery aside, I guess fashion faux pas of the past deserve their own entry. Another lingering memory is the art of leaving the ball. Picture this: Patrick Patterson has the ball in his hand and starts his run up with the small pitter-patter steps that soon turned into thundering strides and gave the man an unstoppable momentum. At the other end stands a small, diminutive Shoaib Mohammad, locked in stance, ready to do battle. The bowler thunders in. The batsman hunkers in. It is a scene right out of a bull fighting arena. The bowler leaps, the ball is delivered and the batsman… leaves the ball! In modern times, this rare occurrence is now known as a dot ball. In the 80s and 90s a test batsman’s best weapon was leaving the ball. What can be worse for a bowler if the batsman simply leaves a ball not heading on to hit the stumps. Add 35C of dry, dusty, summer weather to a recurring theme of leaving the ball (which Shoaib was an expert at) and you have a very potent combination. Leaving the ball with a flourish and exaggerated bravado only added insult to injury. Ijaz Ahmad even had the audacity to present the better part of his backside to the bowler, due more to his extreme stance than to malicious intent. Nonetheless, cricket at its glorious best. Enter the 90s and you meet leaving-the-ball’s worst enemy. Reverse Swing! Those who did try to elegantly and deliberately leave the ball were dismissed in most embarrassing ways. If you were lucky, only your off stump was uprooted. If you weren’t so lucky, even your middle and leg stumps could be affected. Bullfighting too would die if thundering bulls learnt to home in like heat seeking missiles. Also, as one day cricket gained momentum, leaving the ball acquired a negative vibe. If we dig deeper, leaving the ball does have many advantages. It tires the bowler out, it frustrates him to no end, it keeps your own bowlers in the pavilion on a well deserved break and also helps in aiding the wear and tear of the pitch. Most importantly it wears the bowler down mentally. These days, it is a brave man who leaves the ball. He’d rather have a slash, swipe or poke at it (even if it means getting out) than leave it. Waving a red flag in the face of a charging bull and stepping aside at the last moment is an art – so is leaving ball. I love your anology of comparing 'leaving the ball' to 'leaving the bull' - Brilliant! Not only reverse swing has affected this art but also the fact that modern day new ball bowlers bowl the inswinger more often than the ones of the past era did. Glen McGrath, Shaun Pollock, Mohammad Asif are examples of attacking bowlers who have mastered the art of bringing the ball back in after a few outswingers. Whereas, in the past you would find that bowlers operating with the new ball were happy bowling an 'outside the off stump' line throughout their opening spells. Moreover, cricket in general has become a more attacking game, influenced by the large number of ODIs being played. Batsmen like to play their shots these days, and they have the confidence to do so through doing it in the ODI game. Today a Matthew Hayden knows which parts of the ground he can hit a bowl delivered outside his off stump - a Geoff Marsh didn't necessarily know that as he hadn't played that many ODIs. I have vivid images of David Gower's off stump being uprooted by a Waqar Younis inswinger during, while he was leaving the ball during the 1992 test series. I also remember Micheal Atherton being embarassed a number of times by Glen Mcgrath. We too had more than a couple of practioners to whom leaving the ball was meat and drink. The foremost among them was Sunil Gavaskar. The man bored you to tears, by repeatedly ogling at ball whizing past the off stump. Another name that comes readily to mind is that of Yashpal Sharma. I agree with 'q' ODI's and the inswingers have made it a forgotten art. haha, I had forgotten about Gavaskar. He definitely was a fine exponent of leaving the ball. There are no bowlers today who can bowl an outswinger consistently. If they do get an wicket by bowling outswinger it is a mere fluke. Brett Lee bowls very good outswing. He usually sends down 3-4 outswingers before the inswinger. Same for Mohd Asif, he has an amazing delivery that leaves the batsman. RP Singh and Zaheer Khan do the same for India. They have the advantage of being left handed but more recently they have delivered amazing balls that leave the right hander. Mitchell Johnson in the series against India bowled outswing consistently. Ferveez Maharoof has amazing outswingers. So some are still around. I agree the trend has changed to bigger bowlers who bang the ball in hard but the outswingers exist. I was not clear, there are bowlers who bowl a mean outswinger. However, they use it to set up the batsmen. Bowl a couple of outswingers, lull him and then bring in the ball sharply. Yeah thats true Ottayan, as I said most bowlers today would deliver the knock out with an inswinger rather than an outswinger. It would be a good analysis to see how many batsmen have gotten out to the different set of delivers over time but I think thats next to impossible. Another thought - Waqar Younis, after losing all his speed, was an outswing bowler for the last 3-4 years of his career and a pretty succesful one. 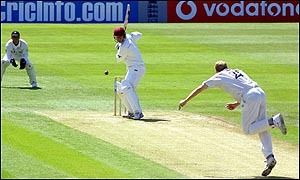 The test match where waqar bowled gower when he was "leaving the bowl" it came in from nowhere and middle wicket was the target. Waqar was bowling round the wicket that was some delivery. Coming back to leaving the ball as the discussion goes everything boils down to pressure. If you consider your self watching a match these days and u c a batsman having lots of dot balls to his credit you start cursing him even though last match he may have made a very fast half century. And especially with the way the pitches are being developed these days "batsman's game" you cant blame them to go after everything. Further if you lissun to the commentary being done these days ( alot of them are doing what inside the box?) they also are a bit harsh on ball being left "too much" or dot balls. i think the nature of the game is dictacting. I havent seen a test match properly for a long time so iam not sure what the situation is there but for one day i guess you just cant leave the ball. from a bowlers prespective i think i would gain more confidence as a person keeps on leaving a lot of my delivery but i also agree with wasting bowlers effort i would then be force to bowl one inside which again can be dispatched anywhere. as a batsman i rather play a bowl defensively then leave it completely but thats just my opinion. I think everyone has overlooked why there are fewer bowlers out there who bowl outswing. Over the past 17 years, with the volume of cricket on an upward trend, bowling actions have been subjected to a great deal of biomechanical analysis. In most countries, bowling coaches have moulded upcoming bowlers actions to be more open chested in order to circumvent potential back injuries. Even in countries like Pakistan, where bowling coaches dont get to influence young tearaways from a tender age, players themselves have been adopting more open chested actions, partly from hearing about how it can prolong careers from the media, and partly because more and more of their potential bowling idols have open chested actions. When you bowl open chested, it becomes much more difficult to bowl outswingers. The natural body movement tends to propel the ball towards the leg side and bringing the ball back from there requires considerable skill. When you bowl side-on, as you unwind at the point of delivery, the ball tends to naturally curve towards off. I've experienced this personally as well. Back in my Aitchison days when i was an extremely side-on bowler, i had a great deal of pace and prodigious outswing. No matter how hard i tried i could not get the ball to swing back in. If i bowled wides, they would be on the offside. One serious back injury and 2 years later in LUMS, i was a front-on medium pacer who got the ball to cut back in off the pitch. My wide deliveries tended to slip down the leg side rather than the off. So all-in-all, the absence of good outswing bowlers has got more to do with the evolution of bowling actions more than anything else. You bring back a classical side-on bowler who is sucessful and doesn't break down with injuries, and soon enough you'll have quite a few young upcoming bowlers trying to model their action similarly. That is quite a brilliant piece Owais and I think ur assessment is spot on. There are far more front on bowlers than side-on ones these days. Actually the only side-on bowlers that come to mind are Lasith Malinga and Fidel Edwards. James Anderson!! Anyone remember his outswingers to Inzi and Co in that fateful world cup? Anyone remember how side-on he used to be? He continued to produce those sort of deliveries against top class batsmen for another year before Duncan Fletcher and the England bowling set-up decided to preserve his future by giving him a more 'dependable' action. He lost his swing. He lost his Mojo. Only recently he's managed to regain his place again and some semblance of swing. Owais - I think James Anderson is perfect example to support what u had said earlier about modified actions resulting in loss of the outswinger. I perfectly remember James Anderson's 2 deliveries to dismiss Inzamam and Mohd. Yousuf in the 2003 world cup game. 1) High volume of cricket leading to modified actions of bowlers resulting in loss of the outswinger. 2) Too much ODI cricket resulting in batsmen playing their shots. You right, the bowling action is one of the reason, also, if you look, the bowlers are using the width of the crease to their advantage. Unfortunately, to the younger set, using the crease means going wide of the crease and bowling just outside the off stump, hoping(there is no science)that the batsmen will play down the wrong line. On a different note, why cant a bowler bowl an occassional ball with side-on action if it will get him a wicket? I remember some of the bowlers were particular where the umpire stood. I also remember instances, when the bails used to get dislodged as the bowlers sometimes brushed against the stumps. Ah! Those were the days, when bowling was an subtle art.